Street artwork has been seen more and more around urban centres across Canada. Murals are a dime a dozen throughout the Saskatoon area but not all of these are welcomed additions. Residential spaces, storefronts and even multi-unit properties might as well be blank canvases for street artists. 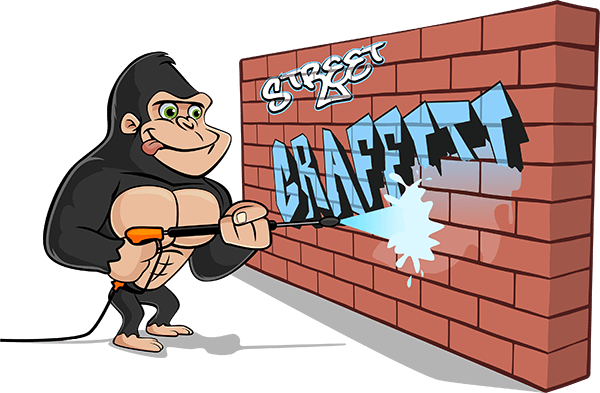 If you are the latest in a long line of graffiti victims, our Gorillas are here to help! Coming home to an unexpected paint job can be stressful but fixing the issue is as easy as booking an appointment for your Saskatoon graffiti removal. When you are looking to give your home or business a pop of colour, it is as easy to go down to a hardware store and choose a house paint. Where house paint is designed to work on the exterior of your space, aerosols are not as accommodating. These paints might be easier to get your hands on, but they are certainly harder to get off. In fact, the longer that aerosol paints are allowed to sit, the deeper it bakes into the materials around your space. These means that typical removal techniques might not yield the same expert results when addressed early-on. Don’t worry though! If you have been dealing with the same eye-sore for a long period, our Gorillas have back-up plans to get those stains gone! The sooner that you address your graffiti issue, the easier it is to get rid of. Some types of aerosol paint is water soluble, making its removal as simple as soap and water. These paints, however, are few and far between. Our highly-trained Gorillas come prepared with the right tools for any job. Eco-friendly cleaning solutions are applied to paint-stained surfaces in order to remove colouring for complete removal. After an application of our cleansing agents, scrubbing and spraying that paint away.